Quilter’s Home– April May 2010 has an article on page 14 that is titled 55 Favorite blogs for Quilters. I saw some of my blog buddies listed like lazygirl quilting.blogspot.com and http://www.cluckclucksew.com/and aquiltinglife.blogspot.com. Of course manquilter.com/Blog.php is listed. http://www.jaybirdquilts.com/and patsloan.typepad.com are always entertaining reads. I checked out some “new to me” blogs such as makeitandloveitblogspot.com, crapivemade.blogspot.com, quiltsabit.blogspot.com and many, many, many more. No picture of this quilt could do it justice. The graphic beauty drew me closer. 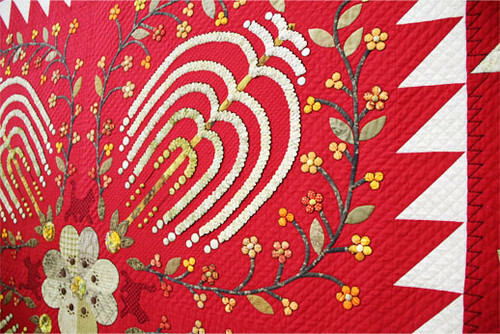 The detail and 3D effects on the quilt were incredible. The tree branches were gathered and zig zagged. Stunning. Love this quilt. Lots of Pieces. Sorry I don’t know who made it but they did win a ribbon! 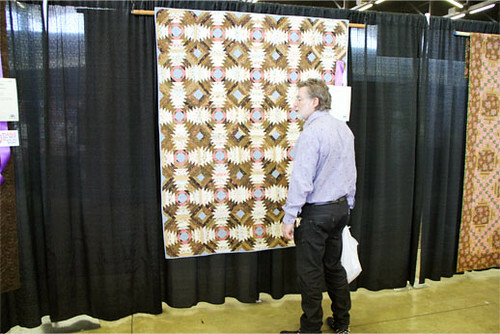 This is a priceless picture of Mark Dunn (my boss) looking at this quilt which is a quilt I made. He turned and saw me taking his pic in front of my quilt. Priceless. Loved this one made by Eun Yeon Yoo of Flower Mound, Texas. Who couldn’t stop and smile at this quilt by Tonya Littmann from Denton, Texas of her son when he was 6 years old. 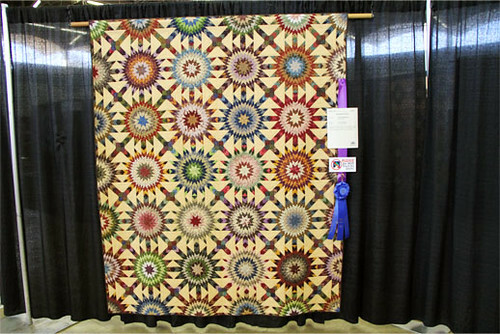 To see more quilts including “The Best of Show” go to my Flickr pool. 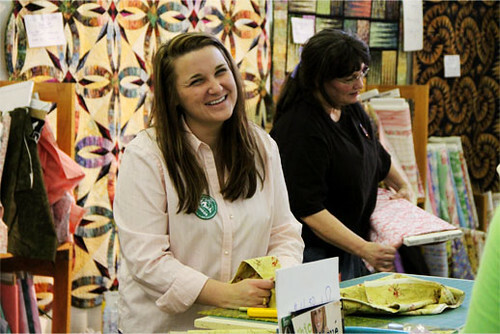 Our very own Sarah Stephenson was also at the quilt show working! Saturday morning I headed off to the Fabulous Finds Spring Fling show. The show was sponsored by Cabbage Rose and Etsy Ft. Worth. Kennedy shown in corner shocked to see a dog shopping! One of the Bottlecap Jewelry booths also had a make it and take it station. Kennedy jumped right in.This show was so refreshing to me. It reminds me of the years that I did exactly what they were doing. Making things and selling them. If you have a show in your area you must go. I already have on my calender, Spring Bash, May 1st, sponsored by Dallas Etsy. A goldmine! It also happens to be across from Cabbage Rose Quilting which is an over the top quilt shop!There were literally groups of women squealing when they came in the door. A great weekend! My niece and I also made a quilt that is featured over at the Moda Bake Shop. Thank you Quilter’s Home for featuring little ol’ me. crazyness!! i seriously want to get in the car & go pick up a copy right now! Congrats! I will do my best to wait for my copy in the mail. It is hard for me to be patient with my quilt magazines. Thanks for sharing! Everything is so inspiring! Whoo hoo Lissa! Now I've got to go tell Matty…. Congratulations…and thanks so much for the mention…I didn't know…will be waiting for this magazine. And the quilts at the Dallas quilt show are amazing…thanks for sharing! Hey thanks a million for mentioning me! What a weekend!! Congrats and thanks for the fun quilt show ride. That one of Mark is fabulous. Wonder if there are any etsy shows in our area? Sounds like a lot of fun. 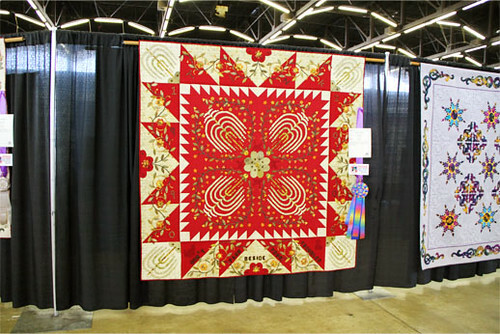 Thank you for sharing the various quilter blogs as well as the great show photos. Moda, who doesn't love Moda? I am a big fan, so fun you get to work for them. Congrats on the mention, that's awesome. I loved the quilt show, looks like you had fun! Thanks for sharing! I LOVE the picture of Mr. Dunn looking at your quilt and the fact that you had the time to get all those pieces together. Hearing about all the fun things to do in Dallas has made me so jealous. I will have to tell you about all the trouble I got into many years ago babysitting my niece! Great quilts! I love the red one and the one right after it with the stars (that one the ribbon.) What stunning quilts! Thanks for sharing!! I'd dearly love to follow this blog, but for the life of me, I can't figure out how. Can you help a girl out?